Aerosmith guitarist Brad Whitford and longtime Ted Nugent vocalist Derek St. Holmes have announced dates for a fall US tour. The reunited pair will play a 2-week run starting November 12 in Milwaukee, WI and wrapping up November 22 in New Hope, PA. The band lineup is rounded out by bassist Chopper Anderson, Tesla drummer Troy Lucketta and keyboardist Buck Johnson. 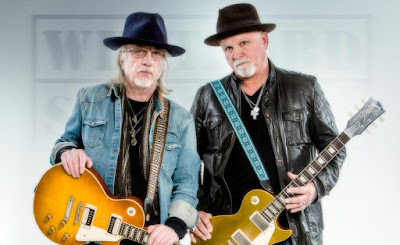 Whitford and St. Holmes – who originally teamed up to release a self-titled album in 1981 – are recording a follow-up called “Reunion”, with plans to release it in 2016. "It's a classic rock album - modern classic rock," Whitford tells Billboard. "I mean, that's what we do. We're all rockers, and we're not gonna try and do anything else but what we know and what we love. "I think a lot of Aerosmith fans are really going to enjoy this record because all I ever hear is, 'When you gonna do another Toys In The Attic? When you gonna do another Rocks?' That's what this album is. It's very straight-ahead, stripped-down classic rock."